Now that the Originals has got picked up. What would you like to see happen to Elijah? What do you think is gonna happen to our Favourite Original Elijah in Season 4? What would you like to see happen to Elijah and the rest of the Originals still standing? i.e: Klaus, Rebekah, Kol, Esther in season 4?? From the start, we’ve had the complicated sibling relationship between Stefan (Paul Wesley) and Damon Salvatore (Ian Somerhalder), both in love with the mortal Elena (Nina Dobrev). "Elena, I hope to see you around sometime soon." "I think it`s time you and I had a little chat." "Klaus is the most feared and hated of the originals, but those who fear him are desperate for his approval. Word gets out that the doppelganger exists and there will be a line of vampires eager to take you to him and I can`t have that." "As a devout feminist, I refuse to say that you hit like a girl." a comment was made to the poll: Who do you wanna see Elijah interact more with on the show and what would you wanna see happen?? 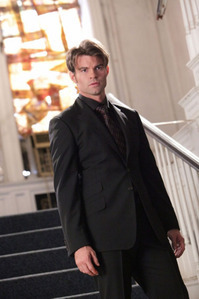 a comment was made to the poll: How do you like Daniel Gillies as Elijah?